Every time I make the 4 1/2 hour drive to see my parents, I can't help but notice the large number of crosses, flowers, even teddy bears and balloons that adorn the roadside. Some are very well maintained, even beautiful while others make me wonder where memorials cross the line into littering. 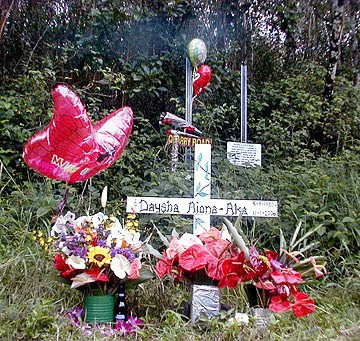 (The photo to the right is a memorial placed on the roadside where a murdered women's body was found.) When I've encountered a particularly eye catching memorial, I will admit to slightly slowing down to check it out. What I never realized until I started researching this post is how very controversial these memorials are. The Room for Debate Blog, run by the New York Times, had a very interesting post about the ongoing battles being had over these sites. They brought in several different experts to argue both sides of the issue. Are they memorials or distractions? Beautiful folkart or driving hazards? Attorney Robert Tiernan successfully defended a man who was accused of illegally removing a roadside memorial. He argues that these memorials are themselves illegal. They use public property for private uses. Crosses and other Christian symbols placed in public places are a violation of the separation of church and state. Memorials are a distraction and a hazard as mourners will commonly stop at inappropriate places to visit and maintain them. They are often elaborate and anchored to the ground which could be a hazard if a motorist lost control and hit one. Another one of the blog panelists, anthropologist Sylvia Grider argues that it is a very old practice, brought over to Mexico and the Southwest US in the 17th century from Spanish colonists whose custom was to mark the site of death with a small cross. They are called descansos. And she argues that these are sacred sites, not necessarily religious even though they may contain religious symbols. "I regard the attempts of various authorities to legislate or regulate this custom as futile and misguided because those who feel the need to memorialize their loved ones near the roadways where they died will continue to do so, regardless of legislation or other attempts at control. In many cases, where authorities have removed roadside shrines, families and loved ones simply replace them. Tradition is a powerful force in society." So where do the states come down on this issue? Some states like Colorado, Wyoming and West Virginia put up their own memorials to cut down on the safetly issues with mourners stopping to maintain sites. 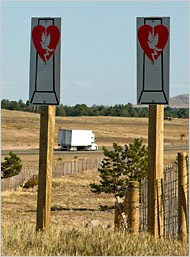 (To the left are the signs placed by the state of Wyoming.) In New Mexico, where the custom is so strong, it is a misdemeanor to remove or vandalize sites. California and Montana allow memorials but only if alcohol was involved. Wisconsin and New Jersey limit the amount of time a memorial can be up. Delaware has developed a sort of roadside memorial park at some highway exits with reflection pools and victims names engraved on red bricks. This is meant to discourage the placement of memorials by giving families a safer place to grieve. Currently, many states have laws regarding roadside memorials. Below is a clip from "Resting Places" which is a documentary on roadside memorials. The three people interviewed are lawyer Robert Tiernan, roadside memorial investigator/photographer David Nance and a mother who made a roadside memorial to her son. This is obviously a much hotter issue than I first realized. I'm not sure what side I come down on. On one hand, it's the job of state governments to keep public spaces clean and hazard free. On the other hand, do state governments cross a line when they dictate how people can and can't grieve? My thought is that there needs to be some sort of meeting in the middle, such as the memorial parks they have in Delaware or the memorial signs that Wyoming places. What do you think? Not sure who the guy is who is concerned about "separation of church and state". Seems to me it's less about promoting Christianity than it is (for the families) remembering loved ones wrenched away young and unexpectedly via a car crash. The dead were Christian, so hence, a cross to mark the spot. When I see these memorials, I often wonder about the significance of the place the person died. A random site on a highway? A location that in life had no meaning to the dead person? Why is that a place that warrants a remembrance as opposed to, say, a home, or school, or some spot that personified who this person was? Great post. Thanks for this and all your others that made me think, "whoa... great post..." that I didn't take time to comment on. In the tradition of the descanso or "place of rest" they (according to the anthropologist) used to place a cross anywhere the body was set down. So when carrying a coffin half a mile to the grave site, any time they needed to set it down to rest, they placed a cross. Another reason they talk about putting up memorials is sort of a traffic warning. "Someone died here so drive safely". I don't know that I buy that. On the busy highways near where I live, there have been several. Some of the more formal ones have a stone or a plaque to remember the person. Others have a laminated sign, and balloons and such. There has been a change in the public grieving. Wikipedia was not far wrong in proposing it was due to Princess Diana's death in 1997. It shows something about the democratising of grief. People do not hide out any more. My Papa really does not like it at all. He says that it tends to glorify the young and dead. As for the crosses, back in the Middle Ages, there was an Eleanor cross in 12 locations of England. It was to commerate the queen. Complex issue. When I lived in FL I saw a lot of these. I thought that some posed a definite traffic hazard but never saw or read about an instance of another accident in the area of the memorial. The "Church & State" argument is spurious on its face as there is no government establishment of religion when a family member or friend places a religious symbol at the site. For me, the only public interest issues are safety and upkeep. It would be more than ironic if a memorial were the cause of another accident. I am going to college to be a funeral director . also taking psychology . If you think about it when people pass away no matter where it is at car wreak, drowning, or drug over dose ect, these families just need a place to grieve and to let go. Their family members did not pass away at the hospital , nursing home, or at home it was on the road . so they want to mark that as their last spot where they were alive. I think they have the right to have flowers or what ever they want as a marker to remember them. Thanks for your comment Rachel. Any thoughts on the safety issue? If it compromises the safety of others on the road, then I am understanding of wanting to find a safer place to memorialize them.